Steel mills world-wide use refractory lined ladles to store and transport molten steel. Over time, the refractory linings degrade or develop cracks which allows the outer shell of the ladle to be exposed to excessive temperatures. If not caught in time, a molten metal breakout can occur, threatening the lives of plant personnel and causing unnecessary downtime and significant damage to equipment. 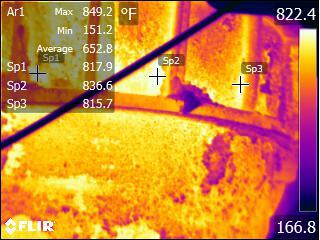 Viper’s Ladle Refractory Monitoring System uses FLIR thermal imaging cameras to monitor the ladle in real time and warn of excessive shell temperature resulting from refractory degradation - ultimately preventing a breakout. This illustration portrays a typical installation for Viper's Ladle Refractory Monitoring system using FLIR compact A-series cameras (or any FLIR A-series camera). Viper's design places three cameras around the ladle and a fourth camera to monitor from underneath. The camera's digital data stream is connected via Ethernet to the ViperVision control system. The ViperVision software controls all camera functions, collect temperature data, displays thermal images and analyzes data.